Barbara spent the last week of May in Lisbon & Porto with an old friend, staying in AirbnB apartments in both cities. She met the challenge of all the hills & stairs in both places, ate great food, & toured many palaces, castles, & churches. Thanks to Nicole who took call for 10 days straight to make this possible! 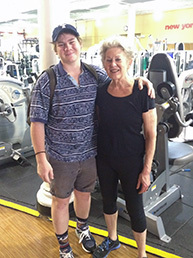 Barbara recently had the pleasure of visits from 2 of her grandchildren. 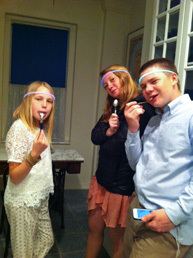 Kieran, 16, spent his Spring Break in NYC & his sister, Kendall, 19, was in town for environmental activist training. They overlapped by one day & were happy to see each other, since Kieran is in high school in Tulsa & Kendall is working in Richmond, Va. Kieran & Barbara went to the Museum of Modern Art & the new Whitney, saw “School of Rock” on Broadway, worked out together at the gym, & had pedicures together (that was his idea!) 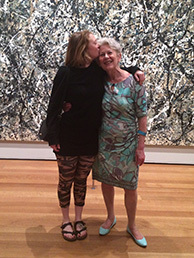 Kendall wanted to go to MOMA too (good thing Barbara is a member) before she left for Japan where she will meet her Aunt Jen & cousin Clementine for Clementine’s Spring Break. Goodbye and Good Luck, Houda! Many of you have had the opportunity to meet the Danish midwifery student who observed our practice during the month of February. 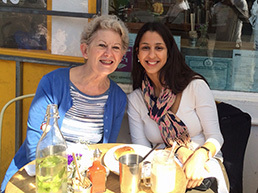 Houda Bourid will finish her midwifery education in Copenhagen after one more semester of study. 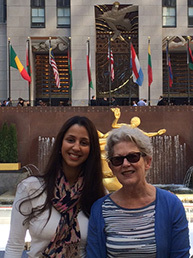 While in NYC, she was able to sit in on the Birthing Center class and prenatal yoga classes at the hospital, Mary Eikeseth’s childbirth education class, and Elaine Keller, CNM’s office hours for a day, as well as participate with Nicole and Barbara in seeing CBS clients for 4 weeks. She was very interested in the scope of midwifery practice here, which is much more extensive than in Denmark. We are happy to be able to foster good relations between midwives of different cultures, and hope we have contributed to Houda’s knowledge of midwifery in this country. 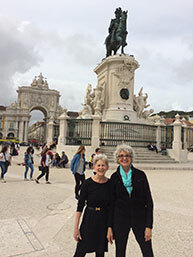 While born and raised in Denmark, Houda’s family is originally from Morocco, so Barbara and Nicole now have an open invitation to visit Rabat! 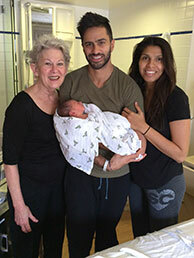 Two CBS Midwifery clients gave birth during the big snowstorm – 7 lb. 5 oz “Graham” came into the world just after midnight, and 8 lb. 5 oz “Valentina” arrived about 18 hours later. Barbara got to watch through the night as the storm gathered force and the snow flew. Later the streets emptied and the quiet descended over NYC – it was a little eerie coming home Saturday evening. When the Starbucks are closed in this town, you know something big is going on. Congratulations to both mommies and daddies! A week before Christmas, 2015, at the Birthing Center – a baby boy born to Sabrina & Faraz. What an honor & a privilege! Please celebrate with us! CBS Midwifery’s 3,500th client gave birth on Thanksgiving Day – we were all so grateful for a beautiful healthy baby girl and 38 years of our practice. Next up: Barbara’s 2,000th! (That’s babies, not birthdays). Stay tuned for the big announcement! 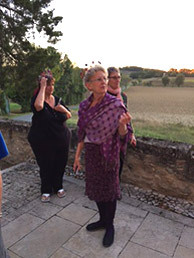 I had a wonderful week at a chateau in the countryside near Lautrec (9/18-23) with 9 other friends of Catherine Carr, to celebrate her birthday. 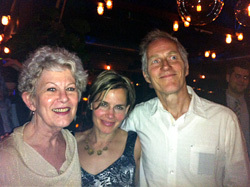 Catherine & I met in nursing school, then became midwives & dear friends. Mornings at the Chateau D’Aragon began with a trip into the village for fresh croissants & pain aux raisins or citron. Then over our coffee or tea & pastries we’d decide who was going where with whom. 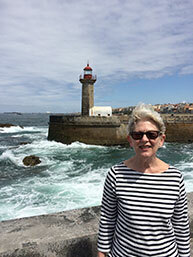 I saw some of Toulouse, Castres, Carcassone, & Albi, & hiked “The Crests” tour around Lautrec. Each evening we had a fabulous dinner cooked by Cousin John, one of the party who’s a professional chef from San Francisco. 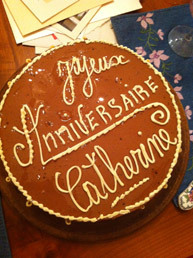 The actual birthday celebration featured a chocolate mousse cake from the local patisserie & the surprise announcement to Catherine that we had established a scholarship in her name through the American College of Nurse Midwives. Many thanks to Nicole for taking good care of all our clients while I was having such a great time! We made crowns out of sparkly pipe cleaners for the party – here’s my royal look! 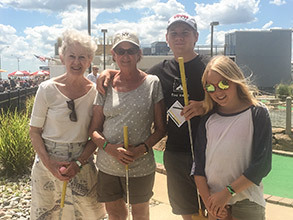 Barbara spent a fun few days at the Jersey Shore with her sister Daphne, granddaughter Clementine, & grandson Kieran. They played pinball when it rained & mini-golf when it didn’t, & had some beautiful beach days. 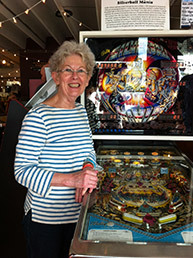 Here is Barbara sharpening her eye-hand coordination at the Silverball Arcade. 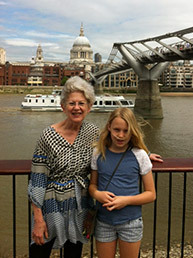 Just got back from a wonderful week in London with my youngest granddaughter, Clementine, who is 12. Lovely weather for boating on the Thames, which she loved. We went by water to the Tower of London one day, the Royal Observatory at Greenwich the next, and to Kew Gardens the day after that. We saw “Billy Elliot” and “Wicked”. But her favorite experience of the whole trip was the exhibit at the Hayward Gallery on the South Bank, which involved shooting down a helical slide 3 stories high on the outside of the building. I did it too! (and did not have a heart attack!). Thanks to Nicole for taking care of everyone so well while I was away – she spent a LOT of time at the hospital! Barbara was the happy M.O.B. (mother of the bride) on April 11, when her daughter Jen married Tim O’Reilly in a ceremony on the Linden Terrace, in Fort Tryon Park. There were 210 friends and family gathered to fete the couple at the sunny if rather chilly exchange of vows, and we all danced and ate and partied until late at the reception at La Marina afterwards.